A: Big Picture: This leaky old house has got to be air tight! Making a Century brick house air tight is no small feat. 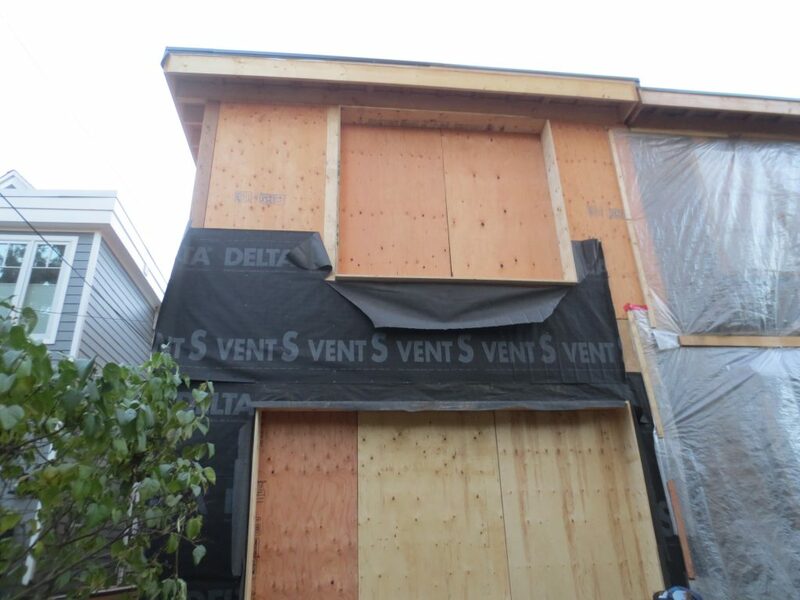 Seal the outside of the house with a continuous membrane air barrier, we used Delta-Vent (shown below). The front wall was not insulated on the outside because we wanted to maintain the appearance of the original masonry facade and keep both sides of the semi looking alike. We insulated the inside of the front wall instead. 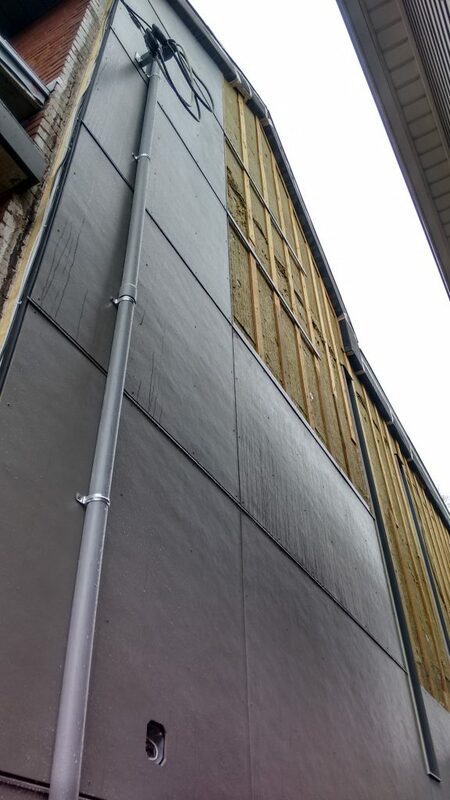 The remainder of the exterior walls are sealed with Cosella-Dorken’s ‘Delta-Vent’, a high performance vapour permeable air barrier and back-up drainage layer. 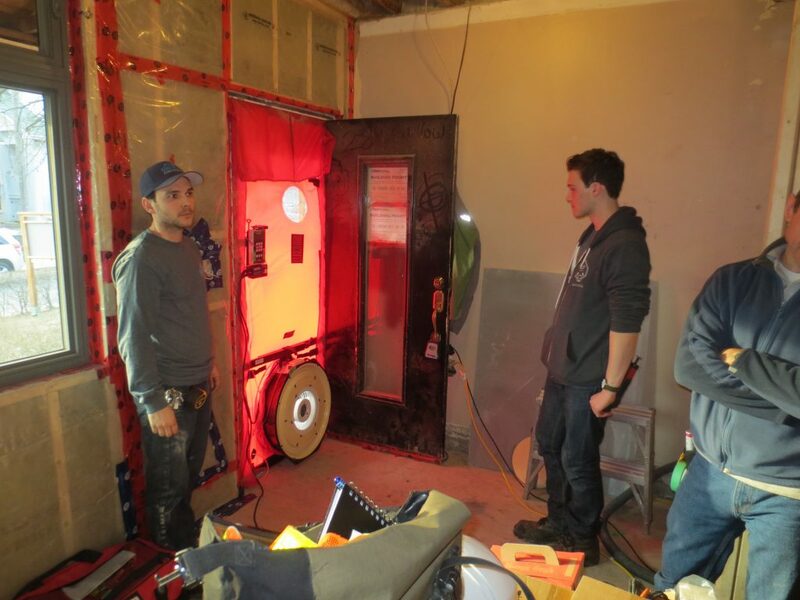 The air tightness was tested and measured by means of a Blower Door Test. Bluegreen Group tested the house and the adjacent house at several stages during the project, starting with the pre-drywall test of the installed air barrier system. By pressurizing the house and then using thermographic images and smoke pencils, we identified and sealed as many leaks as possible. 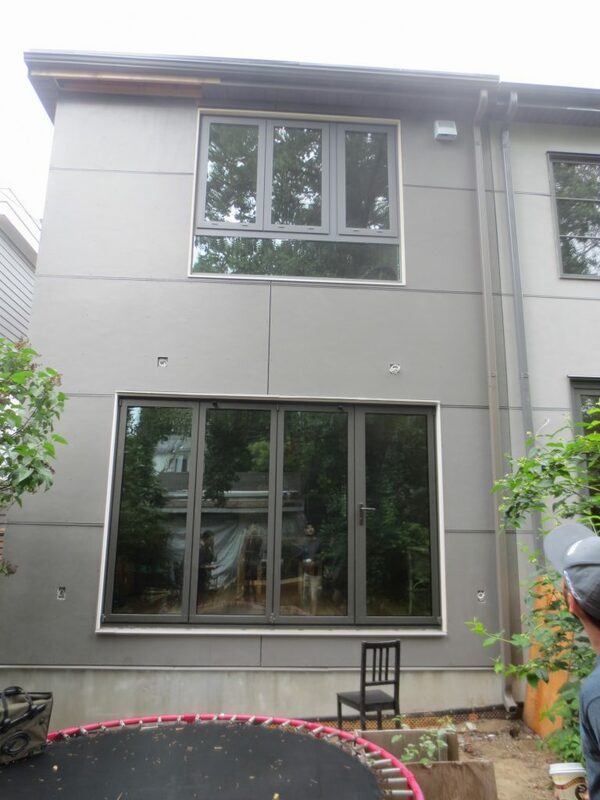 The final blower door tests at 289 Willow Ave measured an impressive 1.97 ACH50.While the O.B.C. will be updated over the next 5 years to make an airtightness of 2.5 Air Changes per Hour at a pressure difference of 50 Pascals [2.5 ACH50] the mandatory level for new construction, no such requirement is envisioned for renovations. We know we could have done even better had we completely sealed the existing party wall, and not exposed the inside face of the brick walls near the front of the house. The double wythe solid masonry construction includes voids in the middle of the brick walls that can allow large leaks through the porous inner face and older mortar joints. 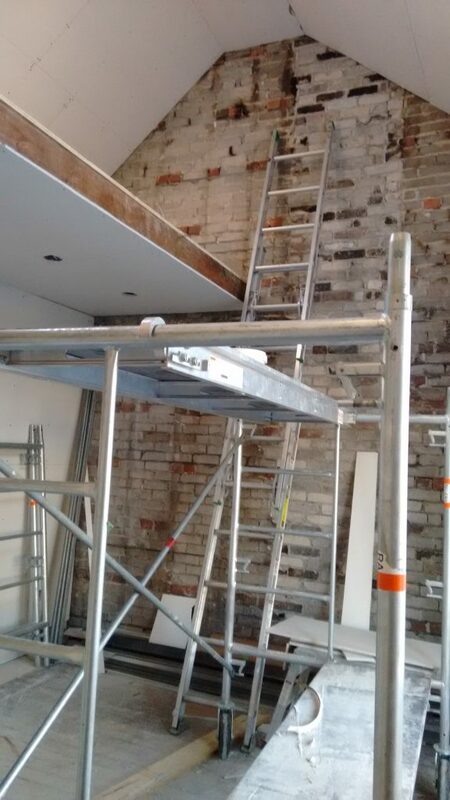 We believe that although airtightness is extremely important, the homeowners loved the texture of the exposed brick and we decided to keep it (and seal it) as a finished surface on the 1st and 2nd storeys. 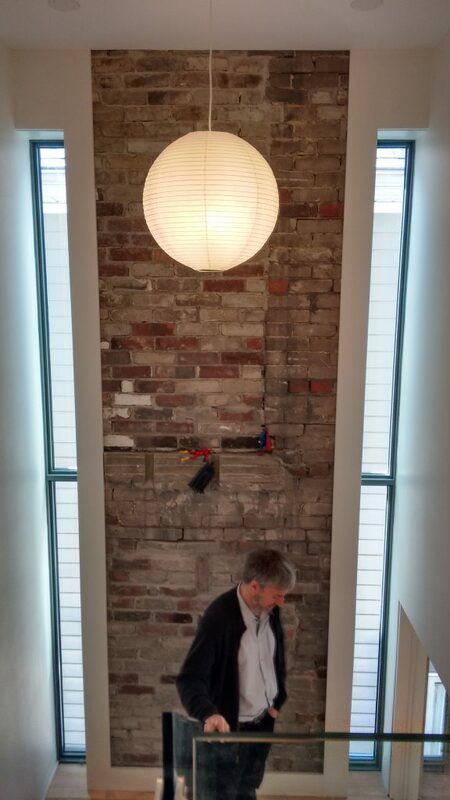 Fortunately, we achieved great results in our testing and the exposed brick didn’t feel like a compromise. What you do not see is the much loved original hearth on the 1st storey. We chose to sacrifice the cozy open fire to eliminate what would have been a major source of air leakage in the building envelope. We’re putting a high efficiency wood burning stove on our wish list for the future. Challenges in getting a continuous seal around the building were transitions between existing elements such as the roof and walls, or the foundation walls and main floor framing. In the case of the point where the roof meets the walls, we carefully wrapped the air barrier around the eaves to seal against the new EPDM roof membrane Where the foundation walls meet the first floor framing we used closed cell Spray Foam Insulation [SPF] to seal and fill gaps. The original 1915 house has no insulation beyond the thermal resistance of the building materials themselves. Interestingly, this is already better than that most glass condo towers in Toronto. The conventional approach of adding insulation to the inside of the walls uses up valuable floor space and results in thermal bridges (or weak points) where the existing floor structure meets the walls. Our initial solution was to wrap the entire house in a warm blanket of new insulation. The continuous nature of this blanket eliminates the thermal bridges.The drawback is that the character of the original brick house would have been lost. Again, the decision to clad the exterior except the front of the house in an insulation blanket and new cladding was to maintain the original look of the house. When adding exterior insulation, we considered the vapour permeance of the materials to avoid trapping undue amounts of moisture within the wall assembly where it can cause damage including the growth of mould. For this reason, we chose Roxul Comfortboard mineral wool insulation boards which provide R-12 of thermal insulation and are vapour permeable but impervious to fire and water. 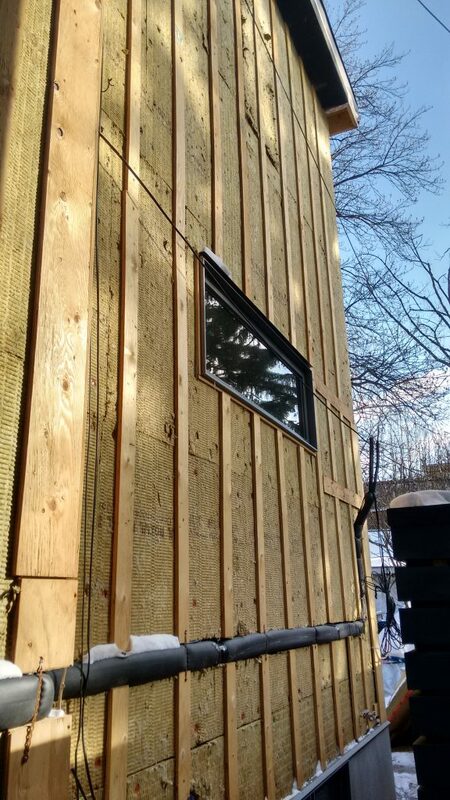 At the outset of the design stage, we had assumed that we would add at least 6” of exterior insulation to achieve thermal performance levels of R-20 or more which is comparable to the typical 2×6 stud wall with batts of insulation between the studs. Bluegreen Group modelled the predicted performance of the building enclosure with a number of different scenarios including 3” and 6” of insulation on the large south facing side wall. To our surprise, there was very little to be gained from adding 6” instead of 3” of insulation. The net impact on the overall energy consumption would have been less than 5% which did not justify either the additional materials and labour costs to install nor the additional embodied energy in the mineral wool itself (although this is speculative). The decision to add an air barrier and insulation to the exterior of the existing house means that a new cladding material needed to be chosen. The cladding needed complement the original brick facade, protect the insulation blanket beneath from the elements, and be durable and eco-friendly. We chose HardiePanel fibre cement cladding in a dark grey to match the new windows. 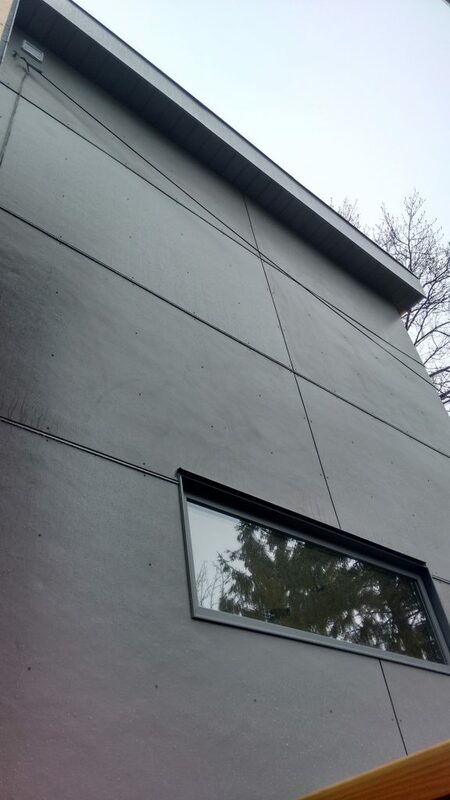 Fibre cement cladding provides a low maintenance finish that is impervious to fire, insects, and rot. The factory applied coating (while not necessarily the most environmentally friendly choice) is extremely durable with a 40+year life expectancy. In order to offset some of the cost of re-cladding we opted for an industrial look with exposed fasteners versus a more labour and cost intensive invisible fastener system. Fibre cement cladding complete. Fasteners are visible on surface. The energy models DID make it clear that the most important surface to insulate was the roof and that adding more insulation here did make sense. 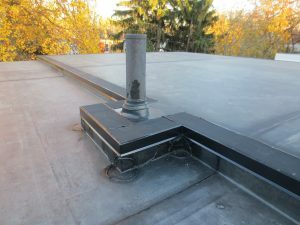 As a result, instead of the original plan to simply insulate the existing roof from below, we opted to also add a continuous layer of new insulation over the original roof deck and install new roofing material (EPDM) on top. The pitched part of the roof which is over the front of the existing house was insulated from the inside and re-clad using Enviroshake shingles. The largest improvement from this strategy was the elimination of the extensive thermal bridges at each roof joist. 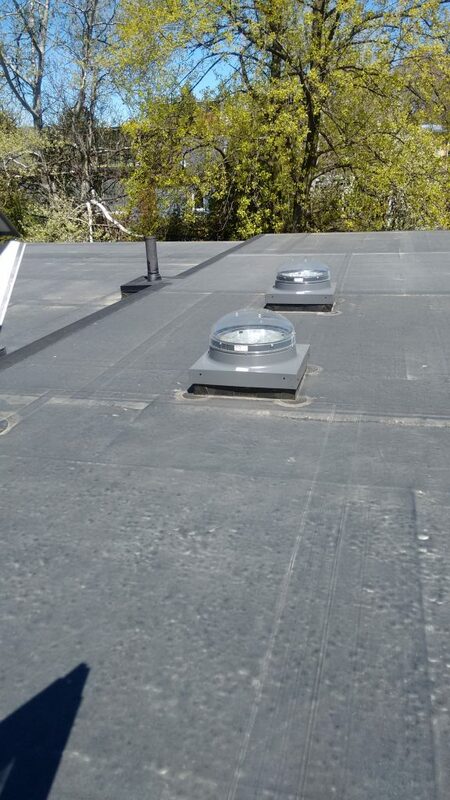 EPDM roofing. 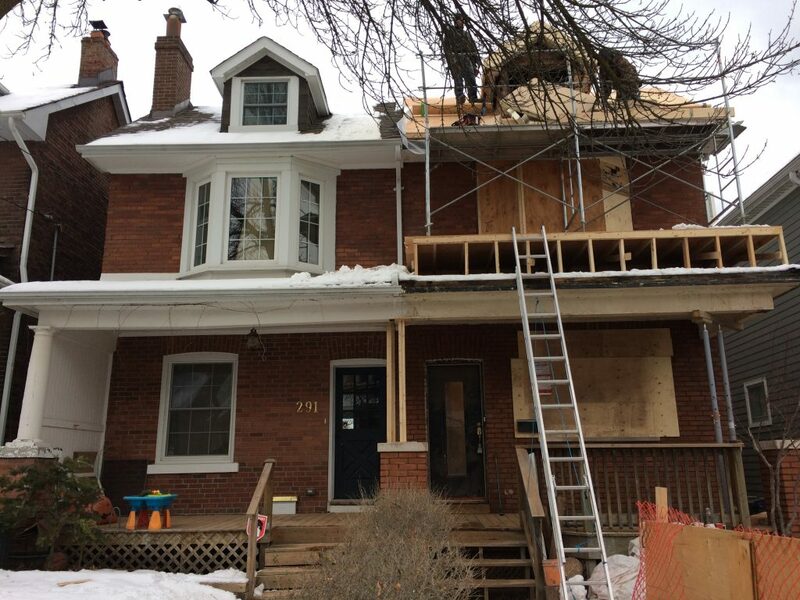 289 Willow’s roof steps up from the adjacent house due to the insulation over the existing roof. 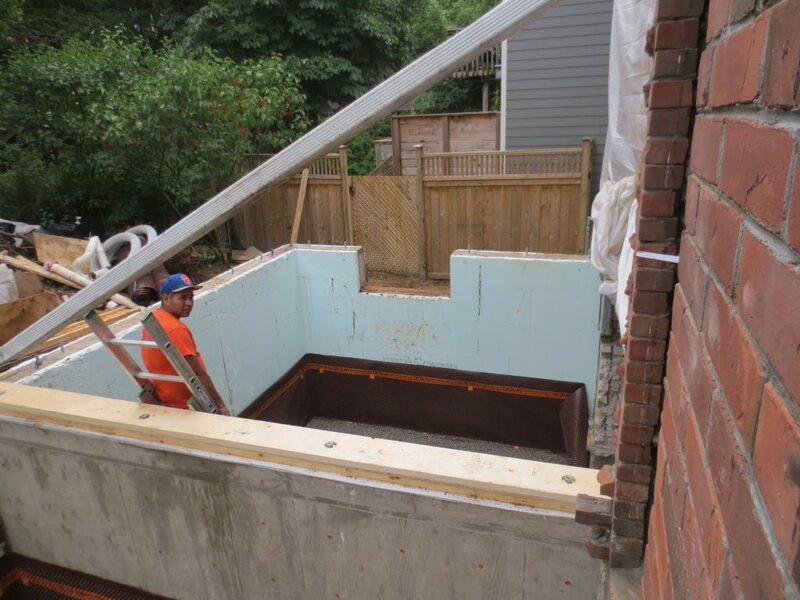 The new foundation walls under the rear addition were built with Nudura Insulated Concrete Forms -commonly referred to as ICFs. 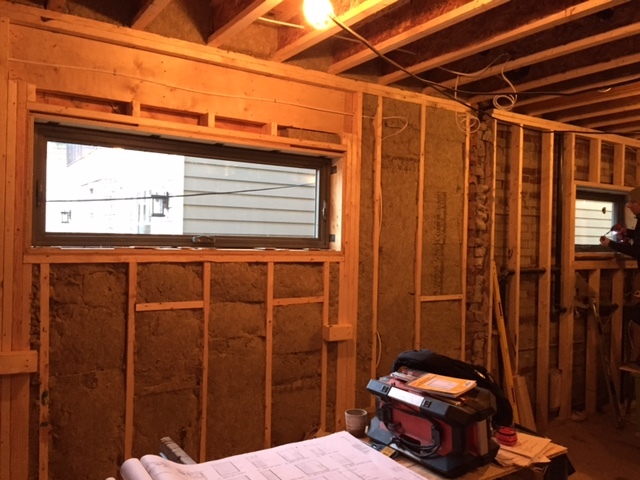 An extra layer of rigid insulation was added on the inside of the ICFs before the drywall was installed. ICF forms shown installed at rear addition. A foam layer sits on the inside and outside of the concrete wall. The existing foundation walls could not be insulated on the exterior face though this would have been most effective. The walls were too close to the neighbours’ house and the lot line to dig down and treat from the exterior. As a result, we opted for a 3-½” layer of closed cell Spray foam insulation against the inside face of the existing masonry foundation walls and new concrete underpinning. Spray foam insulation shown at top of ICF wall where top of wall meets floor framing above. 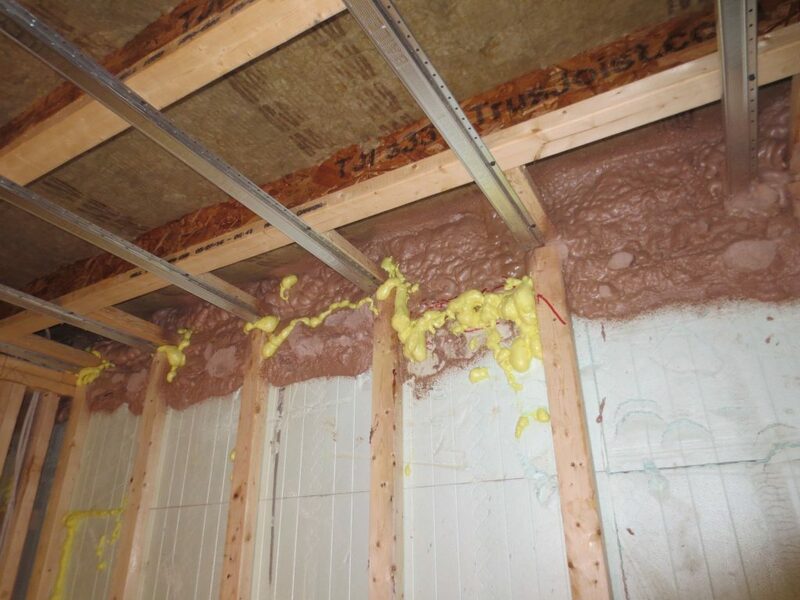 Spray foam insulation is highly effective at filling voids and creating a continuous air barrier and thermal insulation in tough to reach spots such as the rim joists at the top of foundation walls. In certain conditions, the SPF also functions as a vapour retarder, saving the time and cost of installing a sheet of poly-ethylene. The great weakness of SPF is the impact of the blowing agents, which similar to those used in making rigid XPS boards, have a large Global Warming Potential (GWP) meaning that the gases released into the environment trap a large amount of heat in the atmosphere. Recently, a much less damaging blowing agent has been introduced. For this reason, we specified Insulthane SPF with a GWP of just 1, or 99.9% less than the usual HFC blowing agents. Inline Fiberglass was founded over 25 years ago and is a world leader in the development, design and application of High Performance Energy Efficient Windows. Fiberglass features the lowest embodied energy when compared to other common window frame materials like vinyl, and has a long life expectancy (38% longer than vinyl). Fiberglass is a natural insulator because it does not conduct heat and cold, and it doesn’t expand or contract. Other windows use different material combinations: glass with wood, glass with aluminum or glass with vinyl. Newly installed fibreglass window shown from interior of house. New addition shown with fibre cement cladding and triple glazed fibreglass windows. With fiberglass, the components (frame and glazing materials) are identical which means there is minimal expansion and contraction and if there is any, the components expand and contract as a unit. We chose triple glazed (three panes of glass) windows for this project versus the baseline high performance windows that have double glazing (two panes of glass). The benefits are energy efficiency, sound reduction and condensation resistance. The higher insulating values make the house more comfortable, particularly in winter. 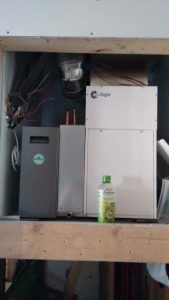 Inside the mechanical closet on the first floor you will see the Ecologix heat pump. This piece of equipment distributes conditioned air -whether heated or cooled- to the ductwork throughout the house. In the 2nd floor laundry closet an energy recovery ventilator (ERV) collects the warmth or coolness in the air as it goes outside and then uses this energy to immediately treat the incoming fresh air. Think of the ERV as the lungs of the house. Ecologix air handler shown in 1st Floor Mechanical Closet. The Nanawall allows a large expanse of the rear wall to be one big glazed opening. The Nanawall gives a beautiful view to the back yard and is an energy conscious glazing choice. Nanawall shown in open position from interior of house. The stairwell is a defining architectural feature of the upper suite. The 12’ tall windows on either side of the landing bleed daylight into the centre of the otherwise unglazed middle part of the house. 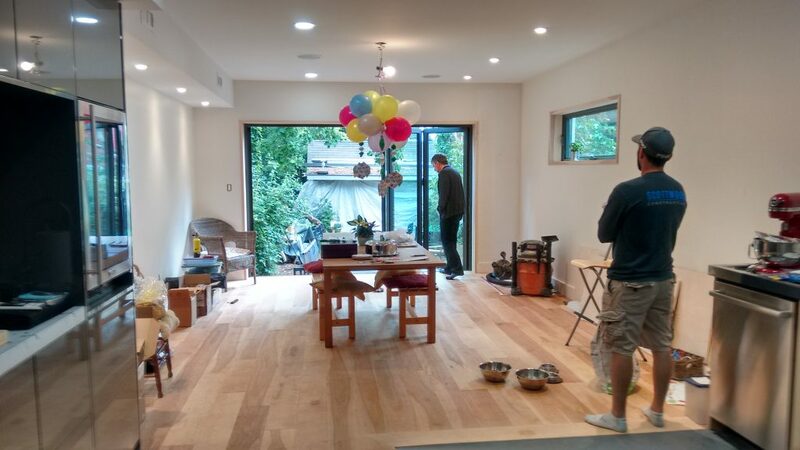 This is a special intervention for a long Toronto home floor plan! Tall windows on either side of stairwell shown as finished. The Sun Tunnels were chosen over flat skylights for the potential to offer less exposed glazing on the building envelope while improving the interior with bright, wide beams of natural daylight. “Dense urban development leads to less urban energy use overall. …such efforts can contribute to mitigating climate change by reducing energy use in urban areas.” Source: Global scenarios of urban density and its impacts on building energy use through 2050, Proceedings of the National Academy of Sciences (PNAS), November 29, 2016. 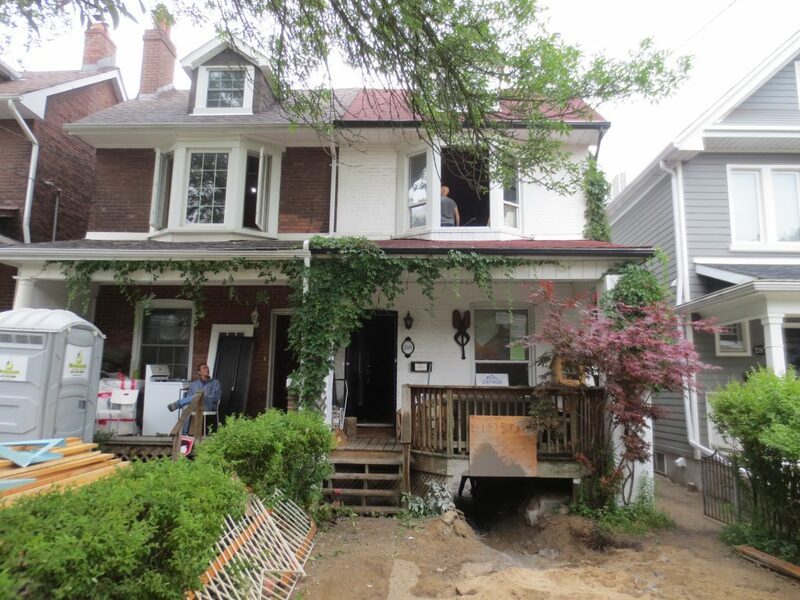 The addition of a legal basement apartment to the house offered the homeowners rental income and for their prospective tenants, a spacious and equitable space to live in a great neighbourhood. The apartment features radiant in-floor heating and a separate ERV for clean, fresh air. Though the apartment is metered separately from the house, the expense of hydro for the tenants should be relatively low thanks to the efficient mechanical design and overall attention to energy efficiency. LED technology was used throughout the house. The slimLED style fixtures on the ceilings were used in place of conventional pot lights. These fixtures provide a range of light temperatures and offer the interior accent and full room lighting. The space saved by opting for slim LEDs versus pot lights meant higher ceilings were achievable and less material was used in the installation of the lights. Though the homeowners enjoy an outdoor bbq’d meal from time to time, they maintained the theme of fossil fuel free living indoors. They eliminated the original gas range and selected an induction range for its sustainability benefits. Induction cooking has been shown to be significantly more efficient at transferring energy, and therefore faster at heating, than other methods thus reducing the total BTUs needed to, say, boil a litre of water. Additionally, gas ranges tend to require greater exhausting of indoor air which can account for additional energy consumption needed to warm or cool replacement air. Bosch induction ranges are among the most energy efficient cooktops available in Canada. PEX is polyethylene that requires additives to create a cross-linked structure to make the pipe stronger. These additives pose unknown health risks. VIPERT is manufactured in Canada by CB Supplies made with PolyEthylene Raised Temperature (PE-RT) which does not need to be cross-linked to meet North American standard requirements. PE-RT is stronger, more flexible, recyclable, and has lower embodied energy, than PEX. 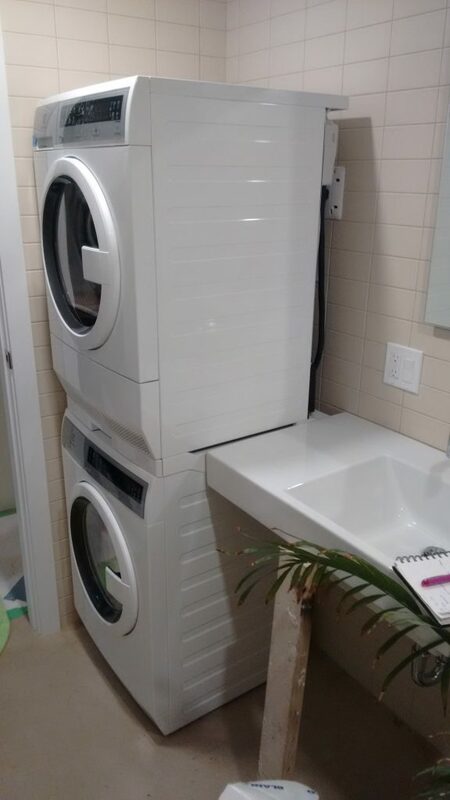 The homeowners selected a Bosch washer and dryer pair that are one of the few ENERGY STAR® qualified 24″ pairs combining engineering quality, water conservation and sustainable design. The dryer is ventless and uses a heat exchanger to condense moisture from the exhaust air which is then collected in a reservoir. The water can be used to water plants or for general purpose washing. In contrast, conventional dryers exhaust moist hot air directly dumping the energy and moisture to the outside environment. Aside from not needing a vent and unnecessarily breaching the building envelope, the most direct advantage to this system is that the HVAC doesn’t have to heat or cool replacement air to make up for the air that’s vented outside. Ventless technology also made situating the machines more flexible. The machines tuck away neatly into their dedicated spaces without occupying any more floor or room space than their footprint and made it an ideal choice for smaller home living. Additionally, since condenser dryers don’t get as hot as vented models, they can also be more gentle on clothes. 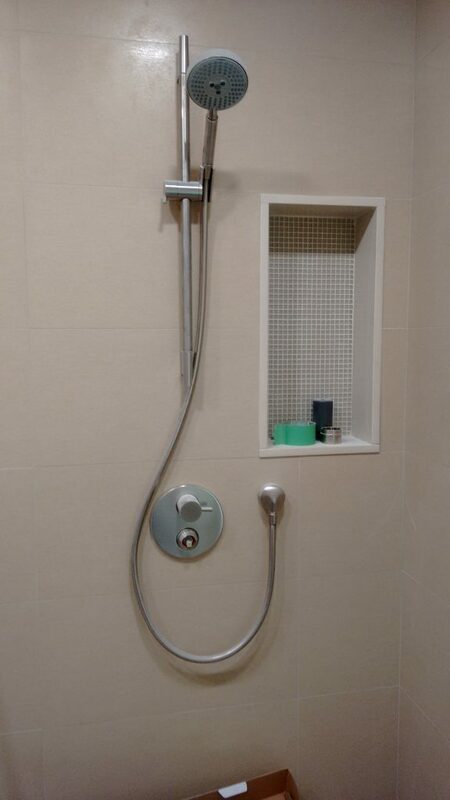 While ventless dryers might seem unusual or new in North America, they’ve been popular in Europe for a long time. In Switzerland it has been illegal to vent clothes dryers to the outside since 2012. The homeowners are planning to install a solar energy solution on the flat roof to generate renewable electricity. This will reduce dependence on grid electricity and give some measure of protection from rate increases. Over the typical 25-year lifetime of the system, there is strong potential for meaningful savings and an expected return on investment of less than 15 years. Both net metering and MicroFIT proposals are currently being assessed for systems that have the potential to generate from 4,000 kWh to 11,000 kWh per year. The average Canadian household consumes almost 1,000 kWh per month while this household, with only electricity for all needs, consumes less than half the national average. The solar energy proposals are also future-ready with options for storage and electric vehicle charging. Basement flooring was left as the new concrete slab. 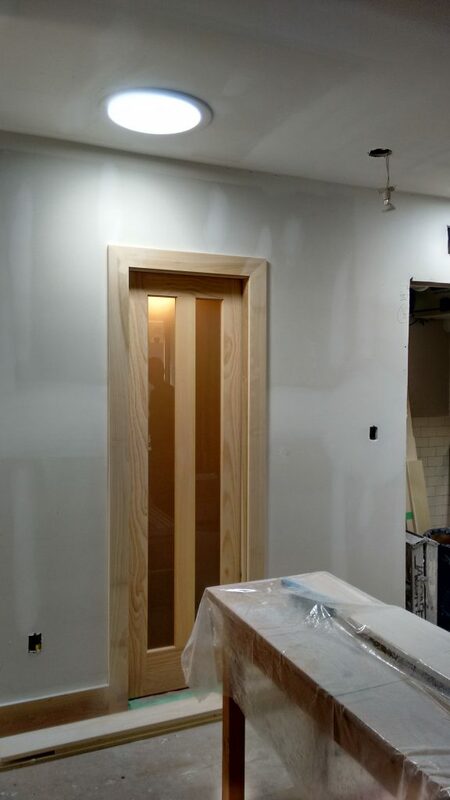 The finish was a clear penetrating zero-VOC product. 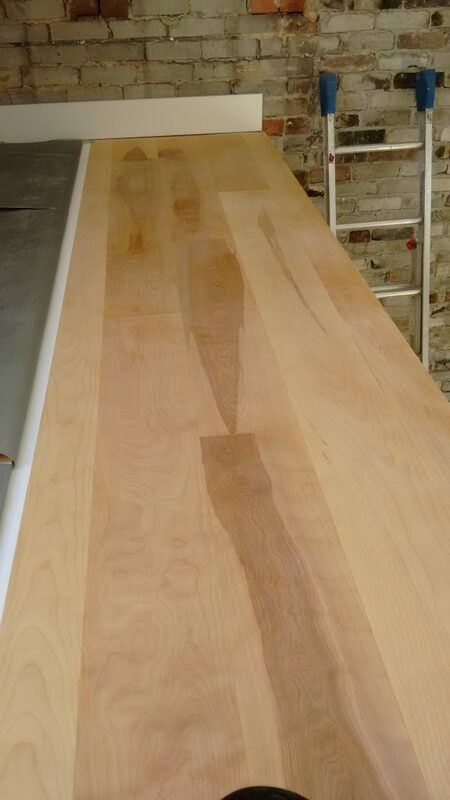 For the upper floors, Canadian wide plank engineered birch sourced from Log’s End was chosen. 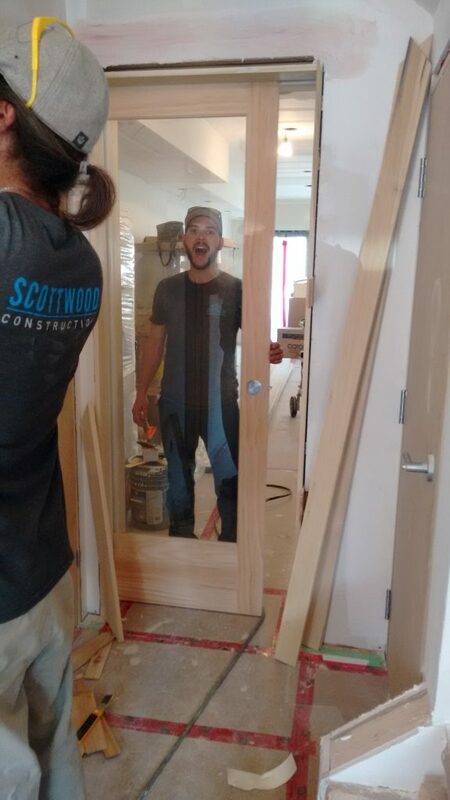 The character of the wood and the plank width were the leftovers of a larger order and worked for the required quantity. The finish is a durable and nontoxic product called Rubio Monocoat. Zero VOC paint was used throughout the house. Tones and finishes that emphasized the beautiful natural light were chosen. Tile was largely selected from local clearance centres. Leftover quantities from larger projects suited the small bathrooms and water closets throughout. Tile purchased outside of the clearance centres was selected for neutrality and durability.